You want to send money to an account and looked up the account number. Somebody asks you ‘What time do we have the appointment with Mr. Smith?’. After answering your short-term memory containing the account number is deleted or the account number you are sure it’s right now contains transposed digits. A reboot removes any not-wanted elements associated with apps or the operating system in the device’s memory and trimming it down to the core elements. Here is a summary of support advices published on Apple’s websites. The image you see is called a mind map. Maps are useful to visualize and summarize content you usually find in textual descriptions. In this case these are support articles published by Apple. Mind maps are not only images. If you use a mind mapping tool (a perfect one for the iPad is iThoughts HD by Craig Scott, UK) you can expand and collapse topics, use the integrated web browser to read more on topics associated with a link, tap on images to magnify them if needed, export and share the maps. 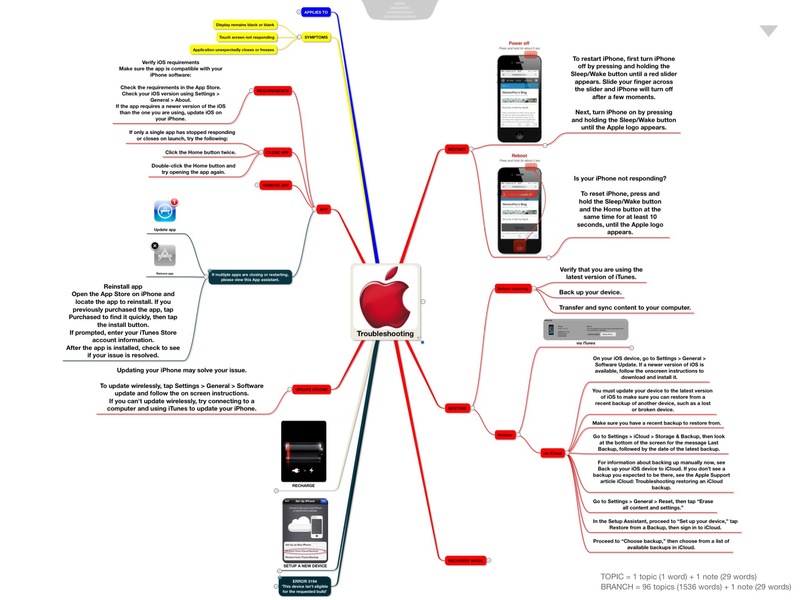 Here are the details of this mind map. You should be careful when deleting an app with which you already manage files. Interactions of an iOS app are limited mostly to the folders associated with it. This limitation is labeled Sandbox-Mode and was designed to increase the security of the filesystem. So if you delete an app the associated files are also deleted. Trust me, I’ve read more than a 1000 knowledge base articles of Microsoft while fighting with flaws in the Windows operating system as well as Office products. Hours of booting, restarting, updating virus scanners, installing patches, localizing buggy drivers, and more annoying tasks abruptly ended with purchasing iOS devices. Admittedly these devices are limited in it’s functionalities but it’s just a question of creativity to compensate this. Reducing the usage of electronic devices to it’s needs can be an advantage. Just focus on essentials. It turns out that Steve Job’s announcement ‘It just works.’ is true and seamless usage is guaranteed when moving into Apple’s ecosystem. 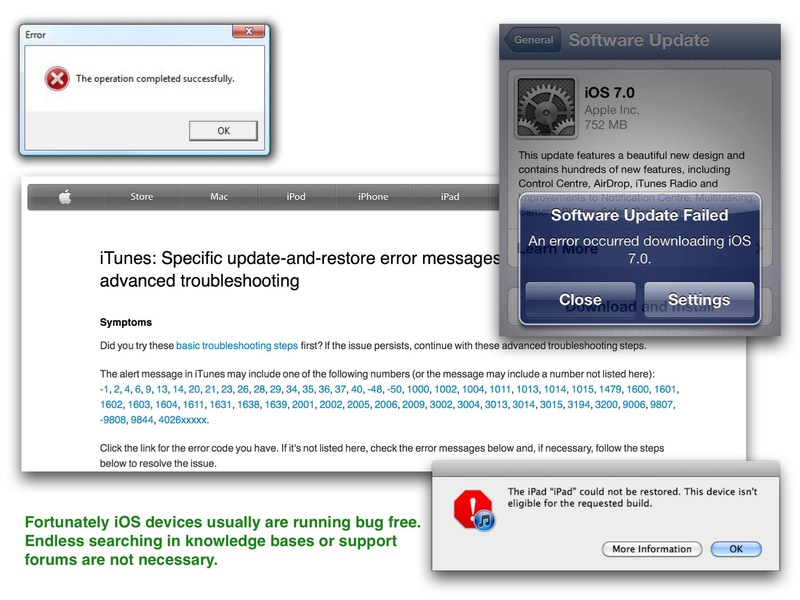 So it’s likely that you don’t need to know any details about troubleshooting on iOS devices. A reboot or the deletion of a buggy app is what you can do if an iOS device causes problems. Apple’s excellent customer service will do the rest if it’s a hardware failure. I hope you never get in trouble with your iOS device.